Firestone Walker came to Colorado back in 2011 and has been a popular California brewery here ever since. 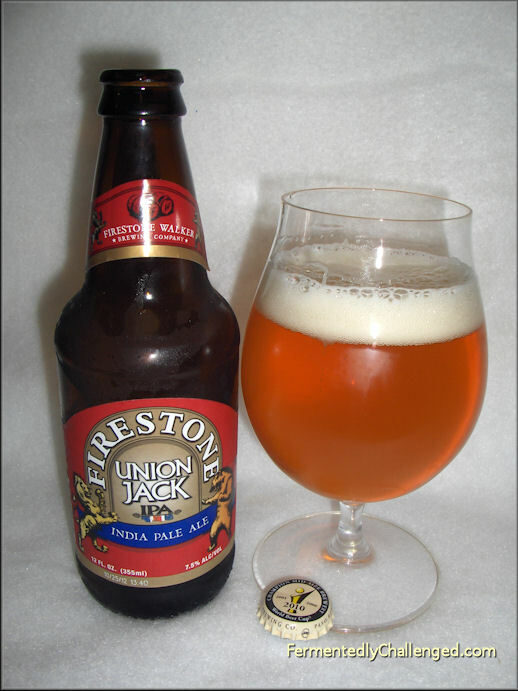 Seems like there is no lack of Firestone Walker tap takeovers and beers on shelves here in Colorado these days. And that's a good thing. Firestone Walker sets the bar high with every beer they bring out of state. This review is of their American IPA called: Firestone Walker Union Jack IPA. It's an Americanize India Pale Ale. Union Jack IPA's vital stats - Style: American IPA, 7.5% ABV, 70 IBU, 8 SRM - Bittering hops: Magnum, Late boil hops: Cascade, Centennial, Dry hopped with: Amarillo, Cascade, Centennial, Citra, Chinook, Simcoe (4-pounds per barrel). Available in 12oz 6-packs or 22oz bombers. Available in 6 states (CA, NV, AZ, WA, OR CO). It's won 11 medals (GABF, World Beer Cup, European, Australia) and several honors since 2008. The "Bottled On" date was missing, so not sure how old this was. This beer's reputation had preceded this review, so I had high expectations of this. Would this beer be able to balance out the big hop load with the malt? Here's what I found. 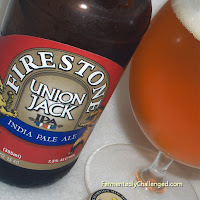 Appearance: Union Jack IPA poured a deep golden yellow color that came with a modest 1 finger white head. There was just a bit of lacing along the edge of the glass that slide easily off the sides. The beer was still rather cold when poured and the beer looked as if it had a hint of haze, otherwise it had mostly good clarity. The carbonation levels seemed good. The bottle opened with a nice hiss. I could not see any sediment in the bottle or in the glass. Just a slight agitation brought back a nice 1/2 inch head and later on the lacing started clinging a lot better. Aroma: The hops took front and center attention upon the first whiff. There was a lot of citrus, grapefruit mostly, plus a hint of pine and a light sweet crystal malt aroma. For an IPA, this aroma hit spot on and was very inviting. It was never lacking in a big aroma. It's the kind of IPA you can practically smell across the room. Taste: For an IPA, this had one of the cleanest tastes I've seen. The hop bitterness was present, but so were the malts. The hop resin was big, yet tasty. It was like a constant back and forth between the bitterness and the slightly sweet malts in the glass. The beer itself felt crisp with a semi-dry finish. It felt clean going down as well without leaving too much bitterness in my mouth. The beer tasted excellent from start to finish. This is what an IPA should be. I can see why the beer ranking sites liked this brew and why this beer won so many medals in the last 4-5 years. In stead of leaving dry, this beer actually left my mouth watering. Overall: If I still gave numerical rankings this beer would nearly hit a perfect score. Everything that I expected out of an American IPA was there. The boatload of hops that they added to this beer was well worth the expense. I might just go back for a 6-pack of this soon. Disclosure: I found this as a single 12oz beer in a build-your-own 6-pack. I paid full retail price for this beer at my local liquor store so it cost me around $1.67. This beer compares well with a Stone Brewing Enjoy By 04.20.13 IPA. - Firestone Walker DBA review. - Firestone Walker Double Jack DIPA review.